This just in: SPECIAL OFFER – tickets now only $10!!! CLICK HERE TO GET YOUR TICKETS NOW! 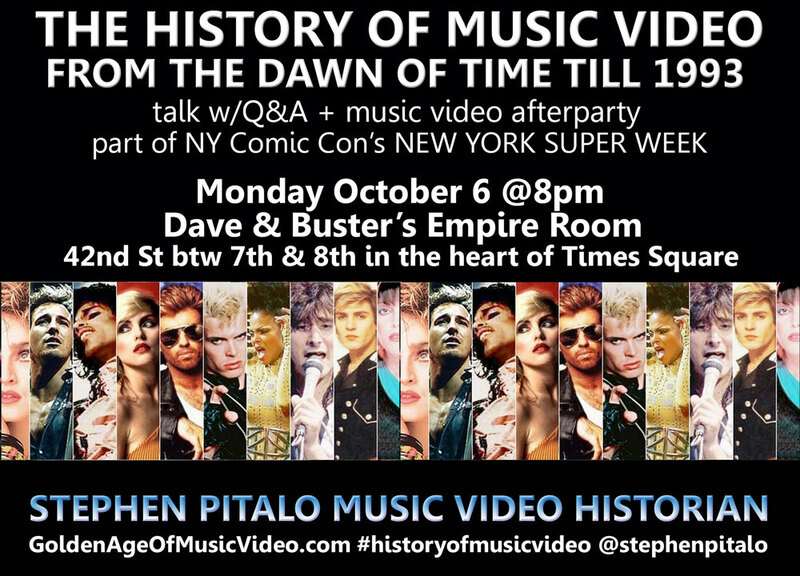 Stephen Pitalo and THE GOLDEN AGE OF MUSIC VIDEO blog are proud to present his critically acclaimed live program THE HISTORY OF MUSIC VIDEO FROM THE DAWN OF TIME TILL 1993 as part of this year’s NY Comic Con’s New York Super Week! Stephen Pitalo is a music video historian who will pull information from his 100 + interviews with music video directors, creatives and artists from the pre-1993 era of the music video. This multimedia presentation includes videos, interviews and historic video clips projected on the big screen. Starting with the early talkies, up through the jazz films, movie musicals, and live music TV shows, Pitalo will discuss the ancestors of the modern music video. Then, we’ll follow the evolution of the form through the Golden Age of Music Video (1976-1993), where international clips of the UK in the 1970s preceded the launch of MTV, and pretty soon the world was glued to the television as performers like Madonna, Michael Jackson, Prince and Duran Duran became stars in the channel’s heyday. He’ll tell inside stories straight from the mouths of those who were there, and eventually show how the music video industry changed how music was sold and perceived, even to this day. As a music video historian & scholar, Pitalo has received huge response from this talk at Live From Memphis Music Video Showcase, Brooklyn Brainery, ReMixed Four Music Video Festival, Film Athens’ Sprockets Music Video Festival. This talk at Videology on August 2nd of this year was spotlighted as a recommended event by Time Out New York. So get your tickets now for this event on Monday, October 6 @ 8pm — followed by a Q&A moderated by Lori Majewski, co-author of MAD WORLD: AN ORAL HISTORY OF THE NEW WAVE ARTISTS AND SONGS THAT DEFINED THE 80s, and a full-on music video dance party — at Dave & Buster’s Empire Room on 42nd Street between 7th and 8th Avenue, in the heart of the most exciting place in New York — Times Square! He will be giving away plenty of vintage MTV prizes, and Dave & Buster’s will provide ticketholders with FREE FOOD AND UNLIMITED DRINKS along with a TEN DOLLAR CREDIT FOR ARCADE GAMES for this very special event.